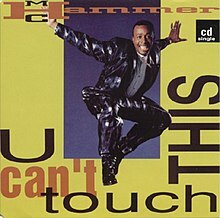 Han’s Worst Hits of the 90’s- U Can’t Touch This- MC Hammer. What can I say about this garbage? The only reason it was a hit was because MC Hammer sampled Rick James great Super Freak opening . It laughingly won the Grammy for Best Rap Solo Performance and was the first Rap song to be up for Record of the Year. MC Hammer was about as much Rap as Lawrence Welk was to Rock N Roll. This is rap for those too timid for the real thing. This was a song like yesterday’s Achy Breaky Heart that you simply couldn’t escape from for a few months- everywhere you went you heard it- or heard someone referencing it. I walked into school one day and the secretary was singing it [not any worse than MC did} The video for the song was also one that you only had to see once. I haven’t seen it in 25 years but I can still remember it. I wonder if Burrell still wears those pants? I can’t even recall any other lyrics in the song but “U can’t touch this”- followed by Rick James Super Freak music. Stanley Burrell as a kid was a batboy and clubhouse assistant for the Oakland A’s. Reggie Jackson nicknamed his Hammer because he looked like the great Henry Aaron. I was surprised to see that Stanley Burrell aka MC Hammer had 5 other Top 40 hits after U Can’t Tough This. I had always thought he had been a one hit wonder- I don’t think I heard any of his other hits. Not that I am kicking myself over that. I wonder if there was an honorable mention for the Worst Pants of the nineties. the pants were even worse than the song. I always appreciate a good belly laugh, thanks for that one. Merry Christmas to you. One of those UK/USA things is that ‘pants’ here mean underpants, with the outer garments being always ‘trousers’. Big baggy pants then means ‘sensible underwear that have been washed too many times’. now come on now are you reading my mind… stay turned for tomorrow i already have that one written up!!! Family Guy did a parody of this that is better than the song…and that is bad. Cloned sentiments to yours on this one in retrospect, even though at the time it played I liked it. Didn’t he build a grand house in his neighbourhood which he then couldn’t sell – cos it was in a rough neighbourhood. That rings a bell- I think you are correct. The best part of this song is my husband, who’s a pretty big guy, putting his hands on his hips, bowing his legs out slightly, and shuffling back and forth quickly along the floor in imitation of Mr. Hammer’s dancing. I bust a gut laughing every time. So I have to thank M.C. Hammer for that, don’t I? MC Hammer was harmless entertainment- and he gave you a great memory. I hated that song but I couldn’t dislike him… Vanilla Ice a different matter.